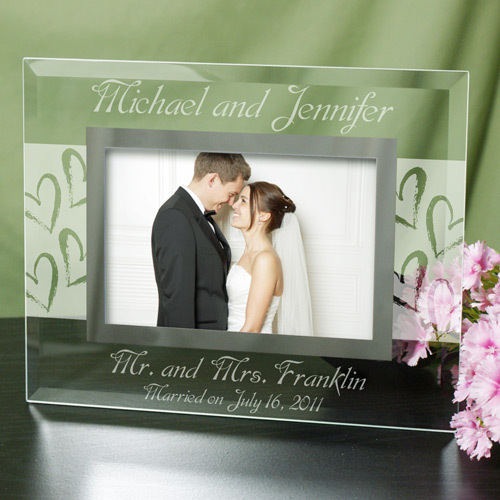 Capture your favorite wedding moment and keep it displayed in our Wedding Glass Personalized Picture Frames. This classic, elegant frame will provide you and your loved one a great memory that will last forever. These wedding Customized Picture Frames include any wedding or anniversary couples names, any title and last name, and wedding or anniversary date. This picture frame exceeded my expectations in its beauty. I gave this to my much-loved niece as one of her Wedding Shower gifts and she cried when she saw it. I had put one of her engagement pictures in it which they can replace with a wedding picture after their August wedding.